New Delhi, June 12, 2018: On June 8, Delhi’s peak electricity demand broke all previous records, hitting a new high of 6,934 megawatt (MW) at 3:28PM. 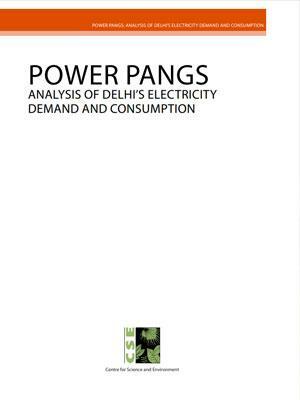 A new analysis by Centre for Science and Environment (CSE), released here today, shows how the insidious link between subsidised electricity, rising ambient temperature, growing use of air conditioners (AC) and inadequate central regulations for energy performance of ACs, is triggering the huge demand for electricity in Delhi. Releasing the analysis, Anumita Roychowdhury, executive director, research and advocacy, CSE, said: "Without any pricing or energy efficiency measures to reduce the demand for electricity or substantial substitution with renewable energy, environmental and economic costs can escalate significantly." “This is starkly evident this summer in the growing demand for electricity and peak demand in the city which is influenced not only by the commercial use of electricity, but also by growing use of energy-intensive appliances for cooling in the household sector. Cheap electricity, rising incomes, and badly designed buildings that trap heat, are inducing demand for energy-intensive active cooling practices and systems upsetting the energy demand of the city,” she added. CSE has carried out an analysis of electricity consumption this summer to understand the trends and nature of demand in the city, and the likely impact of growing dependence on air conditioning to escape the heat. Electricity consumption data has been sourced from daily and monthly reports of the State Load Dispatch Center, Delhi, the apex body which ensures integrated operation of Delhi’s power system. Historical data has been sourced from the annual and Load Generation Balance Reports of the Central Electricity Authority. Consumer and demographic data is sourced from the Delhi Statistical Handbook, while the weather data source is the India Meteorological Department(IMD) weather station at Indira Gandhi International Airport. Delhi hits all time high peak demand for electricity this summer: Delhi’s peak electricity demand had hit a new high of 6,934 MW at 3:28PM on June 8 -- this was 6.25 per cent higher than last year’s high of 6,526 MW recorded on June 6, 2017. Delhi has crossed the 2017 record four times since June 1, and this is not the hottest day of the season so far! The earlier record of 6,526 MW was set on June 6, 2017 which was a hotter day than June 8, 2018. Delhi's peak demand has been consistently higher than that of Mumbai, Kolkata and Chennai taken together during this time of the year. Rapid increase in electricity demand: Electricity consumption in Delhi has grown by almost 42 per cent between 2006-07 and 2017-18. Peak demand has grown by staggering 64 per cent between 2006-07 and 2017-18. On an average, an electrified household in Delhi consumed about 260 kiloWatt-hour (kWh) of electricity monthly in 2016-17, which is almost three times the national figure of 90 kWh. This is similar to the electricity consumption of an average German household. Cooling demand increases night-time peak demand: The starkest evidence ofthepowerful impact of residential use of ACs on electricity demand is the higher night-time peak demand, compared to afternoons. This summer,on several days, demand has peaked during night – recording higher levels than the day time demand. This has happened even when all commercial uses including offices, retail and education institutions are closed at night. During the month of May, for as many as 21 days, late night peak demand has been higher -- up from 14 days in 2016. A typical summer day in Delhi has two peaks, one during the day (driven by commercial activities) and other around midnight (driven by residential sector). On an average, these two peaks have become almost identical now. The average day peak during the period May 1-May 31, 2018, was 5,280 MW daily during afternoon (between 3.00-4.00 PM); the average daily night peak was 5,256 MW (11.00 PM-midnight) – a small difference of merely 0.5 per cent. Weekdaysvs weekends: The impact of residential demand for electricity is so substantial that the average electricity demand on weekends is just 4 per cent lower than the demand on weekdays. This slight difference is caused mostly by about 8 per cent drop in demand during the day time, while the night demand remains the same. In the early 2010s, day peak during the weekend used to be higher than the night peaks; but last year, almost 95 per cent of the weekend night peak was higher. Drastic decline in electricity demand after dust storm and temperature drop proves high impact of ACs on electricity demand: Interestingly, the link between ambient temperature, use of ACs and electricity demand is directly evident from the days of the storms and squalls in Delhi when temperature drops temporarily. For instance, on June 9, when a thunderstorm brought down ambient temperature from 34oC to 24oC between 5:00-5:30 PM, the peak demand for electricity fell from 5,600 MW to 3,323 MW (a 41 per cent drop). This shows the impact of cooling requirement on Delhi's peak energy demand. Electricity subsidy inciting energy-intensive cooling: The Delhi Electricity Regulatory Commission has slashed electricity rates for domestic consumers by 12-25 per cent across all consumption slabs this year. The new tariff is among the lowest in the country -- but the Delhi government makes it even cheaper by providing a 66 per cent subsidy on the rate for households that consume less than 400 units a month and an additional rebate of Rs 100 on the fixed charge to households that consume less than 100 units a month. The effective electricity rate in Delhi is Rs 1/unit for the first 200 units,and Rs 1.5 for the next 200 units. The 400 subsidised units can accommodate use of one AC, lights, fans and other appliances depending on the nature of use. If a 3-star split AC runs for six hours a day for 30 days in a month, it will consume about 260 kWh of electricity, which can be easily covered under the subsidised 400 units a month offered by the Delhi government. Delhi government data shows that the subsidy was availed by 82 per cent of homes last year – which means even higher income households are benefitting from the subsidy and the low rates, since there is no mandatefor energy audits or compulsory disclosure of annual energy consumption. Even if consumption crosses the limit for subsidy, the normal rates are very low -- much lower compared to other mega cities. In Mumbai,the electricity price ranges from Rs 3.67 to Rs 10.37 per unit; in Kolkata, Rs 4.89 to Rs 8.92 per unit; in Noida,Rs 3 to Rs 5 per unit; in Gurugram,Rs 2.7 to Rs 6.3 per unit; and in Bengaluru,Rs 3.4 to Rs 7.6 per unit. Even the highest slab with maximum rate in Delhi kicks in only if the monthly consumption crosses 1,200 units and is charged just Rs 7.75 per unit;in comparison, the maximum tariff in Mumbai is of Rs 9.95 per unit and is applicable on all monthly consumption above 500 units. Moreover, Delhi does not impose any penalty for over-consumption. Gurugram rescinds the benefit slab if the monthly consumption crosses over 800 units and charges a flat Rs 7.10 per unit for all the units consumed. Delhi produces only about 20 per cent of the electricity it consumes in a year and barely 2 per cent of its energy requirement is met by renewable sources. Central government policies at fault too – energy efficiency standards for ACslagging behind global best practices: Between 2013 and 2018, India produced over 26.5 million AC units, of which about 60 per cent were 3-star. A recently released report, "The Future of Cooling" by the International Energy Agency, notes that when it comes to energy efficiency of ACs, India has the worst market average of measure of energy efficiency (3.2 Seasonal Energy Efficiency Ratio) compared to major economies like the US, Europe, Canada, China, Japan, Korea, and Singapore. It also notes that the best AC (6.2 Seasonal Energy Efficiency Ratio) available in India is subpar compared to the global best practice. In other economies, the SEER varies from 11 in Europe; 7.7 in Japan; 9.7 in South Korea; 7.5 in China; and 12.3 in USA. Weak energy efficiency standard of ACs worsens energy impacts: Energy performance of an air conditioning system depends on the outdoor weather conditions and indoor temperature settings. A 2016 study by CSE had found an average 20 per cent increase in the energy consumption of a 5-star split AC compared to its labeling when outdoor temperatures hit 45o It also noted that cooling capacity also dropped by 13-15 percent. After the release of the CSE report,the Bureau of Energy Efficiency(BEE) extended the Indian Seasonal Energy Efficiency Ratio (ISEER) ratings that were originally designed for invertor ACs to split and window ACs as well. ISEER is supposed to take into account the varying performancesof ACs under different outdoor temperature conditions and computes efficiency by comparing energy consumed at the cooling provided over a year based on historical metrological data. However, the system is still generic and defeats the purpose of ISEER which is supposed to provide realistic data to consumers. This often leads to under-reporting of energy consumption. ISEER for split and window ACs is tweaked in a fashion that it gives the same efficiency rating as under the old system (which the CSE study had found to be faulty). There is a 2-star difference between ISEER benchmark for window ACs and split ACs, even though both run on same fixed-speed compressor technology. In other words, a 5-star window AC is only as efficient as a 3-star split AC. This is causing unnecessary confusion among customers, giving a false impression of prospective savings to buyers of window ACs. Electricity consumption in Delhi higher than individual consumption of some states: According to the newly released report of the Central Electricity Authority on Load Generation Balance Report 2017-18, Delhi is consuming more electricity than any of the following individual states: Himachal Pradesh, Jammu & Kashmir, Uttarakhand, Chhattisgarh, Goa, Kerala, Bihar, Jharkhand, Odisha, Sikkim and all states of the North-east. Delhi’s residential energy consumption is even more shocking. The total energy consumed by Delhi households is more than that of all households in Gujarat, one of the richest states, with a population about three times that of Delhi. Already in Delhi, the household electricity consumption per capita is about 43 units per month as against national average of 25 units per month. Need energy-efficient building stock: The intensity and duration of AC use can be reduced substantially if buildings are designed more sensibly to reduce heat gain. Summer heat is being trapped by climate-insensitive construction and a highly concretised urban-scape. Inappropriate architectural design and material used in the hot and dry climate of Delhi -- such as glass-dominant structures, predominant use of concrete, and use of large windows and flat concrete roofs without shading -- traps a lot of heat. Even though the nights are cooler, buildings cannot release heat effectively, and hence require active cooling. According to an estimate by the BEE, ACs also contribute almost 60 per cent of the Delhi’s peak electricity demand. According to the IEA report, India is to see a 15-fold jump in demand for power for space cooling by 2050. But savings is possible by influencing the demand for electricity. This can help to a great extent to prevent the unintended consequences of energy insecurity, pollution and climate impacts. Introduce mandatory energy audit and effective pricing for consumption-based energy billing to improve operational efficiency of all buildings. Make it obligatory for all buildings to disclose publicly the data on annual energy usage along with the built-up area. Implement post-construction performance, accountability and transparency to ensure that the buildings remain high performing. Introduce penalty for high and over consumption. Include domestic sector as a designate consumer in the Energy Conservation Act, 2001 and come up with schemes to reduce energy guzzling in this sector. The Energy Conservation Act of 2001 doesnot recognise the domestic sector as an energy guzzler and excludes it from all the efforts which are being made to conserve energy. This should be amended so that the proposed Residential Energy Conservation Building Code can be made binding. Fix the AC efficiency standards (star labeling) to account for performance variations as per actual environmental conditions. Introduce labeling as per the climatic zone instead of a generic national one, as is done with ECBC and NBC. Introduce efficiency standards for air-coolers and revise the standards for ceiling fans. Adopt a summer cooling action plan requiring all establishments to operate ACs at 26oC or above (as the one adopted by Japan). Link incentives for green buildings for developers with stringent benchmarks and not with minimum green measures that all buildings must do. Set quantifiable energy performance targets for different building typologies to reduce overall energy intensity and consumption over time. Create more policy opportunities for use of natural ventilation, shading and day lighting to improve thermal comfort and reduce mechanical cooling of spaces inside buildings and also over-use of glass in facades. BEE needs aggressive ratcheting up of minimum efficiency standards in India,along with fiscal measures to make the most efficient technology also most cost-effective. The city needs an extreme heat action plan which helps reduce formation of urban heat islands and reduces the cooling load on the grid. For interviews etc, please contact Parul Tiwari of The CSE Media Resource Centre, parul@cseindia.org / 9891838367.